Max Stewart completed his doctorate at Edinburgh University and Edinburgh College of Art. It was the first joint PhD between those two institutions. Before turning to glass in 2000, Stewart worked in animation as a production designer, chiefly at the BBC and Channel 4 (UK). 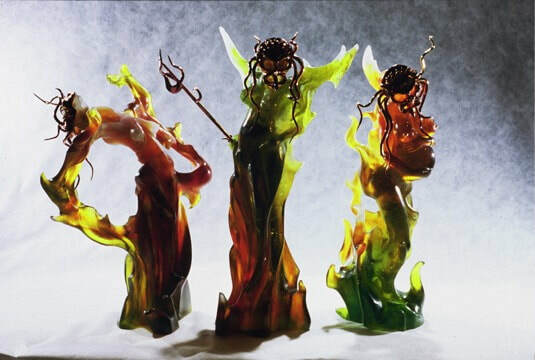 Stewart is a sculptor who explores imagery through the medium of glass. Working in pâte de verre, he challenges the viewer to step inside the object and become the participant. By doing so the viewer encounters the space between what he sees and what he thinks he sees. Much of Stewart’s practice is research led and is informed by processes that are akin to scientific enquiry. His practice is also derived from the techniques and methodology of the French pâte de verre artist Amalric Walter (1870-1959) that have become central to his work.